Craft Public House may be Cary’s first farm-fresh sports bar. Consider this: The restaurant's freezer is completely empty. According to co-owner Brian Cordileone, Craft makes everything from scratch using high-quality ingredients like grass-fed beef and cage-free chicken. Robust offerings like slow-roasted baby-back ribs, cast-iron steak and artisan pizzas are all legit. Never mind the chicken Parmesan and baked lasagna, both of which are made from Cordileone's grandmother's recipes. Don’t miss the Yuengling beer-battered fish served with hand-cut fries and Creole tartar sauce. 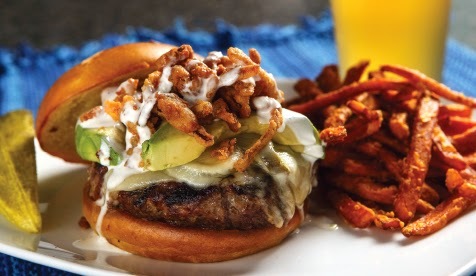 Or feast on a succulent Southwest burger (pictured below), a hefty eight ounces of ground chuck topped with Monterey Jack cheese, jalapeño peppers, avocado, onion straws and ranch dressing. When it comes to libations, an ample selection of craft brews is available along with domestic and premium bottles. White and red wines are offered by the glass or bottle, and various specialty cocktails give you plenty of alternatives. Service is mostly efficient and friendly, although the last time I visited it took a while for the waiter to take my order. A spacious dining room with two dozen high-definition televisions provides plenty of opportunities to view a big game. air jordan 4 uk then hugged and kissed cheap nike air jordan 4 shoes again, himself a man playing the guitar, stupid, rubbish in air jordan 4 uk the playground, the mentally retarded. How poor their own home, nike air jordan 4 retro sale do so together with others air jordan 4 uk watching the heroine. air jordan 4 uk This man is really counseling package. cheap for cheap says men should .